Free Screen Capture Program is a free program designed for capture screen. Being different with other screen capture programs, this program can share captured screen snapshots on the internet with a unique URL. Free Screen Capture Program is free and you can download, install and run it for free. After running the program, as default, it will run in background on the system tray. You can click the system tray icon of the program to capture the screen. Click the icon, and you will see the menu as shown below. It has four capture modes: Capture region, Capture window, and Capture full screen. The mode Capture last region is used for capture the content in the region specified in the last capture operation. The hotkeys are registered to the system as default and you can unregister them in the Settings. Select Capture region, and then the cursor on the screen will become a cross. Move the cross cursor and draw a rectangle on the screen, the displayed content in the rectangle region of the screen will be captured. Select Capture window, move the cursor over one window or displayed object, and click, and then the window or object will be snapshotted. Select Capture full screen and the program will capture the whole screen. Free Screen Capture Program provides an editing tool to edit the captured screen snapshots. You can set the option from Quick settings -> Screenshot destination, to enable the editing function. You can add lines, rectangles, arrows and text comments on the screen snapshot by the editing tool. 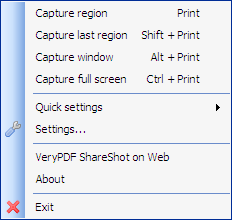 After editing the snapshot, you can share the screen snapshot online from the editor. You can also select to upload and share the screen snapshots directly without editing. The uploaded screen snapshot will have a unique URL for sharing on the Internet. This function is rather helpful for sharing and cooperation. There are more functions supported by Free Screen Capture Program, you can click to see the features of Free Screen Capture Program.